June 13: Less than a week after PETA broke its disturbing investigation, Deployment Medicine International has been indefinitely suspended from receiving any federal contracts, including for its cruel trauma training on animals! Update: Congressman Hank Johnson, a member of the House Armed Services Committee, has asked the secretary of defense for a full investigation into the evidence of abuse released by PETA concerning appalling mistreatment of animals, racism and other reported abuse of soldiers by DMI, why DMI has continued to receive federal contracts, and whether there are other instances of misconduct by DMI and other contractors that have not yet been reported. Rep. Johnson is also the main sponsor of the BEST Practices Act, a much-needed bill that would phase out the use of animals in these cruel military medical training drills in favor of superior simulation methods. Tell your Congressional Representatives to SUPPORT the Battlefield Excellence through Superior Training (BEST) Practices Act (S. 587/H.R. 1095) which will finally end the use of animals in crude military training courses. PETA released a bombshell exposé of the highly secretive and horrific world of military trauma training, in which thousands of live animals are violently shot, stabbed, dismembered and killed each year. Eyewitness video footage released by PETA and related documents reveal shocking abuse of animals, racism, homophobia, sexism and reported physical and sexual assault of military service members by a leading military training contractor. PETA’s disturbing investigation—which broke today via Reuters— documented a training course attended by members of the Navy, Air Force and civilians led by a company called Deployment Medicine International (DMI), which is the self-proclaimed "largest trainer of US military forces in operational medicine." 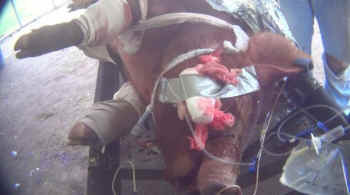 In the eyewitness video, instructors shot live pigs in the face and limbs with shotguns, cut into the animals with knives to cause massive bleeding, and carve open one pig’s chest and cut out his heart. The footage shows pigs who are apparently inadequately sedated trying to wake up while they’re being mutilated. When addressing the controversial nature of the animal laboratories, a callous DMI instructor tells a room of students that Muslims "would be even better" than using pigs for this deadly training. Other DMI staff made several inappropriate sexual and homophobic remarks to the students during the course. Additionally, PETA uncovered a damning report from the Virginia Board of Medicine, which shows that the agency recently suspended the medical license of DMI’s president for his alleged sexual assault and other physical abuse of service members during similar courses over the same time period, including apparent retaliation against a student critical of animal use. Shooting, stabbing, and otherwise maiming animals is an ineffective and crude way to teach human medicine, but it’s great at fostering the kind of callousness towards others—human and animal—that PETA has documented.